Every year at Passover we invoke his name and welcome him into our homes even though he hasn't phoned ahead and doesn't bring so much as an Entenmann's. And we marvel at the fact that in one night he manages to visit the homes of each and every Jewish person having a Seder and does it without a sleigh and eight tiny reindeer! 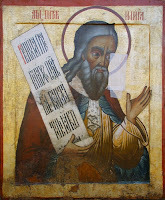 But who really is this ancient Biblical figure known as Elijah the Prophet, or Big Eli for short? We're in search of Elijah the Prophet, a quest that encompasses a painstaking reading of the Holy Scriptures, deep discussion with learned rabbis, and a quick perusal of Wikipedia including the plea for money at the top of the page. 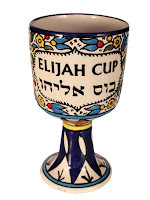 As we await Elijah's annual arrival, it's a good idea to bone up about him so we don't accidentally welcome in the wrong prophet and wind up with some of the silverware missing. The origins of Elijah are quite obscure. Virtually all he know about him stems from the Holy Scriptures, the Talmud, and Elijah for Dummies, which is in its third printing. Most visual depictions of Elijah come out of the Christian tradition and are of doubtful reliability, especially those in which he wears a cross the size of a barnyard door. Elijah lived in Israel in the 9th Century B.C., so it's likely he was almost as technologically clueless as the average Baby Boomer. From a very early age, Elijah demonstrated great zeal for the Lord and often demonstrated it for the entire class as part of "Great Zeal Show and Tell." "Elijah doth call down suffering and destruction upon the faithless ones through fire and brimstone, short sheeting of their beds, and girl friends who lookest like Methuselah!" It seems clear that Elijah probably rarely got invited to parties. Elijah spoke out with special fervor against the worship of a deity named Baal. Refusing to play ball with Baal, he resolved to test the powers of God and Baal by having altars built to both and bidding the adherents of each to pray for their favored deity to light the altars. Sure enough, Baal called in sick while God put on a sound and light show almost as good as the one at Epcot Center. Baal still can't find work today. It is written in the Scriptures that when his earthy sojourn was completed Elijah was lifted up onto the heavens in a mighty whirlwind, which had not been predicted. It's likely had a weather babe been around who could nail a forecast the way Moses could nail a plague of locusts Elijah would have stayed indoors and wound up with an earthly sojourn culminating years later by choking on some white fish in Boca. 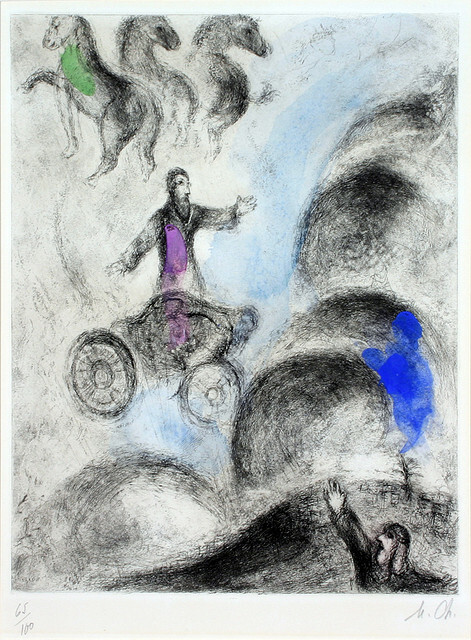 Of course, Elijah is still alive and very much with us every Passover. Each year at the Seder, Jews worldwide open their doors to Elijah, hoping for him to enter but also praying he doesn't eat much. 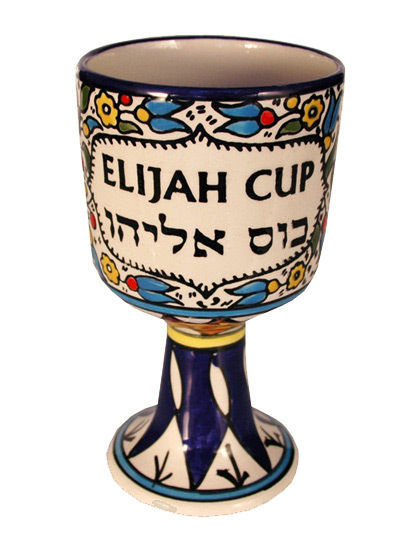 A special cup of wine known as Elijah's Cup is laid out for him because it's the least we can do for such a distinguished guest, even though he never thinks to bring us so much as a sponge cake! How does he make it to every Seder in one night? True, he isn't loaded down with presents, but with 12 million Jews around the world, he can't be any slouch either. Does he drive a hybrid? Does he have a rocket ship? Either way, assuming he takes even a small sip from the cup at each Seder, maybe we should take his keys? Does he actually drink from Elijah's Cup? This is the Jewish equivalent of "every mother's child is going to spy to see if reindeers really know how to fly." Assuming your mother's children have already spied, best ask them about this one --- preferably before they ransack the house for the Afikomen. Does he ever leave? Unfortunately, he does frequently miss social cues like "Oh, my, look at the hour" and "I've got an early appointment," but with solid technique you can get him out before Shavuous. Just place his cup next to mouthy Uncle Claude who thinks Obama is a Muslim or let it be known that Mrs. Pressman --- the hot divorcee who showed such a provocative interest in him at last year's Seder --- won't be making it to this one. Why can't we see him? He's invisible, dumbass! If Harry Potter can manage it, don't you think Big Eli can do it without even breaking a sweat under his tallis? And so, folks, this year let's all welcome Elijah with open arms and full heart knowing he has now been fully vetted and given a complete background check. In a season of friendly faces around the table, Elijah brings us his own friendly face which --- albeit invisible --- helps bind together all people, Jews and gentiles alike, in the spirit of freedom which is Passover. If you liked this post, you might also like A Rickie Gervais Pesach!, The Eight Days of Passover Redux, and Go Down, Twitter. If you hated this post, I hope your brisket is burned, your matzoh balls leaden, and 3,000 year old Elijah never leaves and starts dating your daughter! As we sing in the south, "Swing down chariot, stop and let me ride." Yeah, I wanna be hitching a ride too, Russell. But tell me: where are we going?